Hiring? 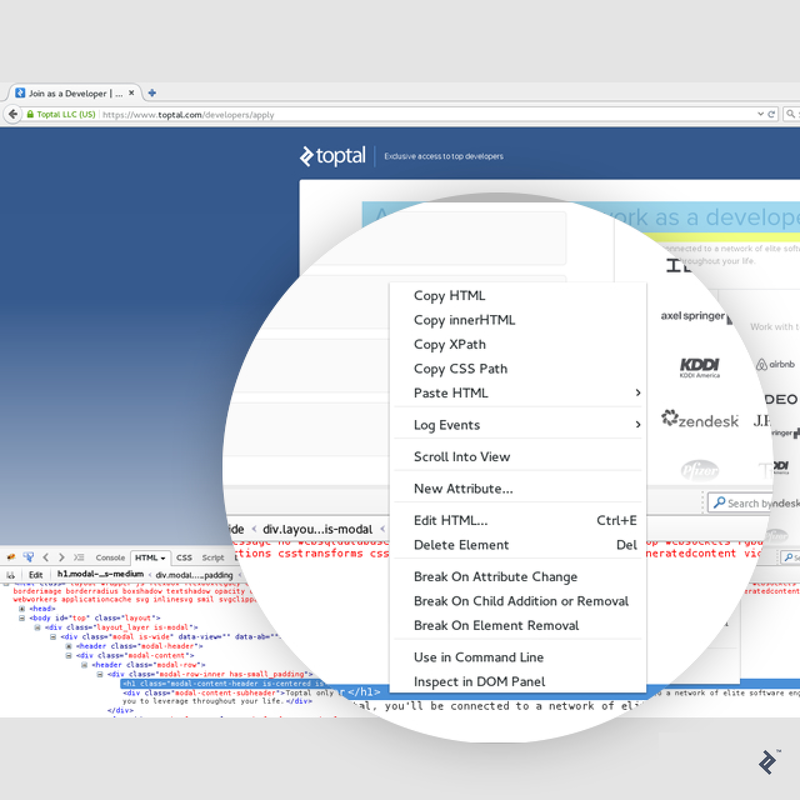 Toptal handpicks top Selenium developers to suit your needs. Dejan is a senior QA with significant experience in web and mobile testing. He has also worked extensively on Android app development. 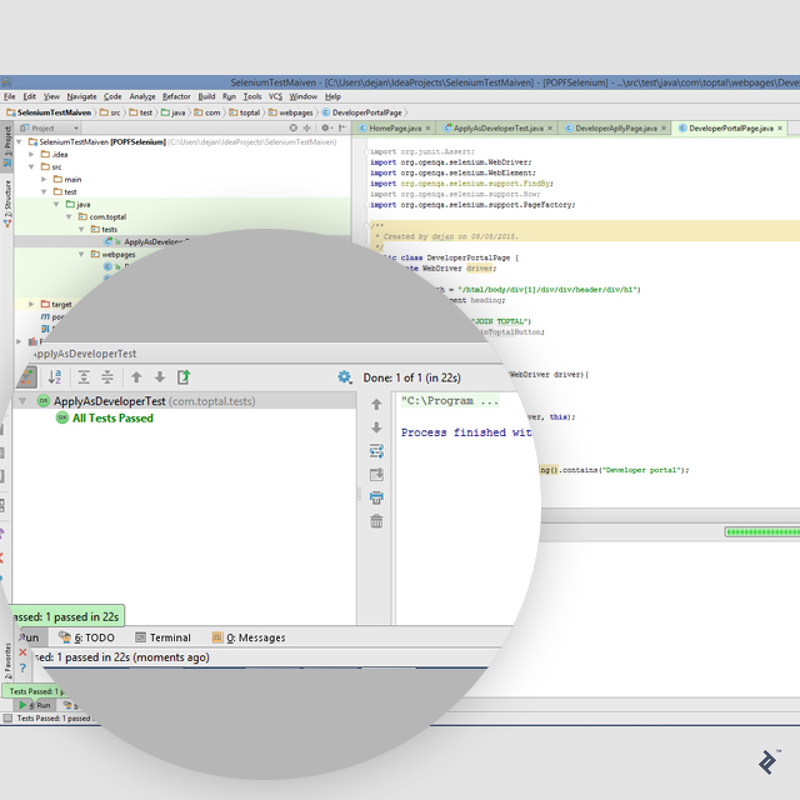 Writing automated tests is more than just a luxury for any agile software development team. It is a need, and is an essential tool to find bugs quickly during early phases of software development cycles. When there is a new feature that is still in development phase, developers can run automated tests and see how other parts of the system are affected by those changes. This article will explain how you can speed up automated testing using Page Object model in Selenium. Through test automation, it is possible to lower the cost of bug fixing and bring overall improvement to the software quality assurance (QA) process. With proper tests, developers get a chance at finding and resolving bugs even before it gets to QA. Test automation further helps us to automate test cases and features that are constantly regressing. 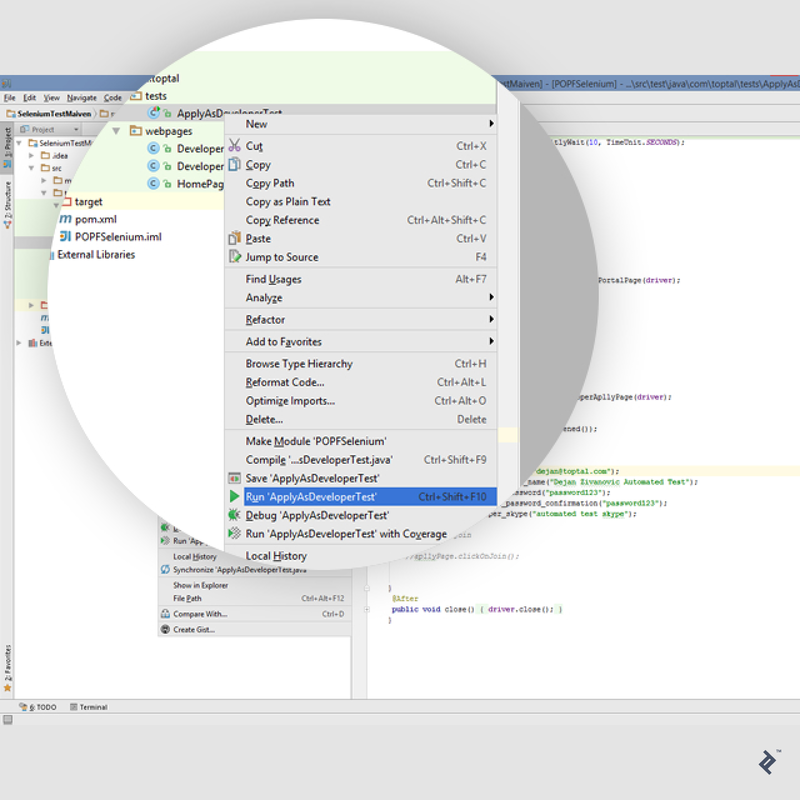 This way QAs have more time in testing other parts of the application. Moreover, this helps in ensuring quality of the product in production releases. As a result, we get products that are effectively more stable, and a QA process that is more efficient. In order to support Page Object model, we use Page Factory. Page Factory in Selenium is an extension to Page Object and can be used in various ways. In this case we will use Page Factory to initialize web elements that are defined in web page classes or Page Objects. Now that we can represent web pages as Java classes and use Page Factory to initialize WebElement variables easily, it is time we see how we can write simple Selenium tests using the Page Object pattern and Page Factory. What is Page Object model in Selenium? Page Object model is an object design pattern in Selenium. Web pages are represented as classes, and elements on the page are defined as variables on the class, so user interactions can then be implemented as methods on the class. Why do we use Selenium? Selenium is designed to automate web browsers, thus enabling software engineers to greatly speed up and automate testing. 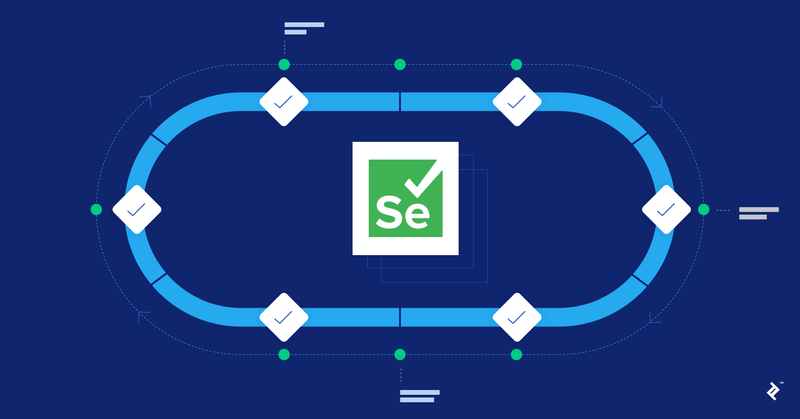 While test automation is its primary use, Selenium can also be used to automate certain repetitive actions, such as basic administration tasks. Selenium testing is the process of using a set of Selenium software tools to facilitate test automation. In most cases, software engineers choose one to two Selenium tools for this task, but additional tools can be employed to meet different needs. What's the difference between Page Object model and Page Factory? Page Object model is a design pattern, as previously outlined in this section. Page Factory expands on Page Object model functionality by introducing more advanced features. 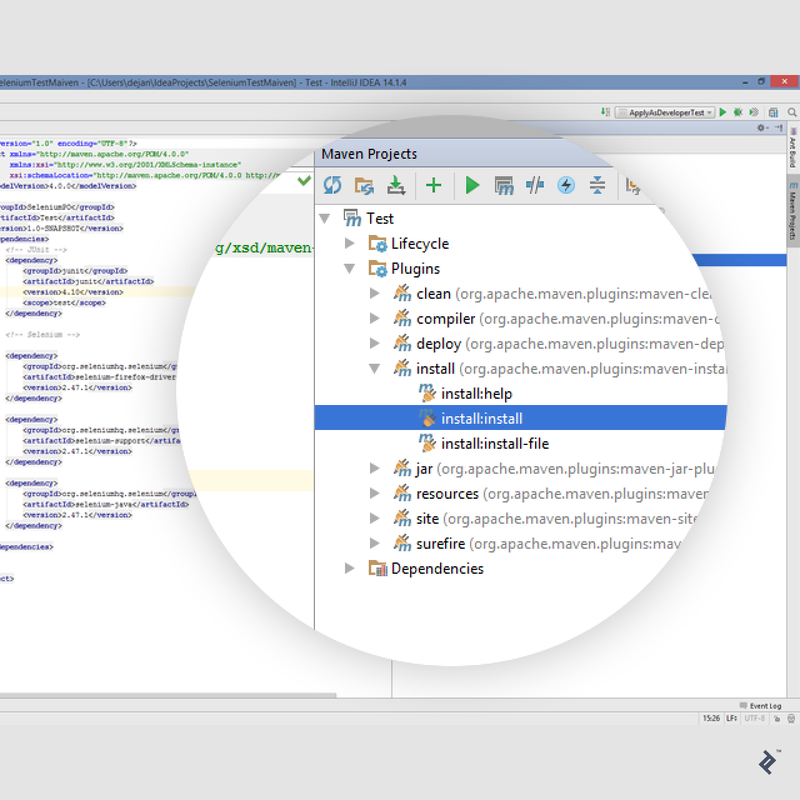 It allows users to initialize specific elements within the Page Object model, using annotations. Is it possible to implement Explicit wait or Fluent wait in Page object when trying to handle method calling from Page object to test class? https://github.com/yandex-qatools/htmlelements There is a nice library which greatly extends described approach. Excellent article about POM. Thank you! Thanks for the nice article. But one point if multiple @Test present than I have to again create the same page object? 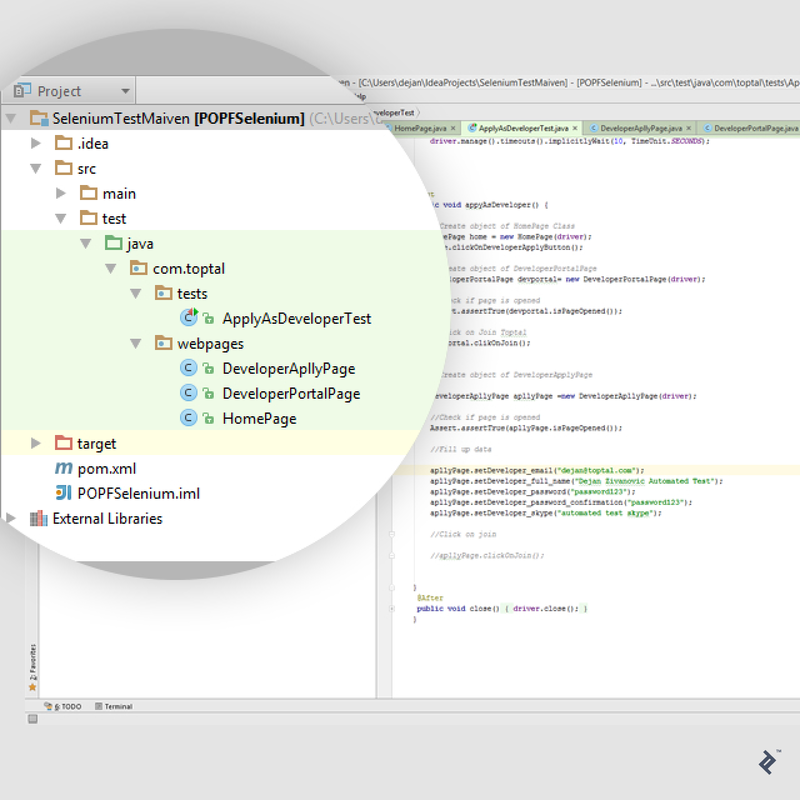 like DeveloperPortalPage devportal= new DeveloperPortalPage(driver) in my second test? 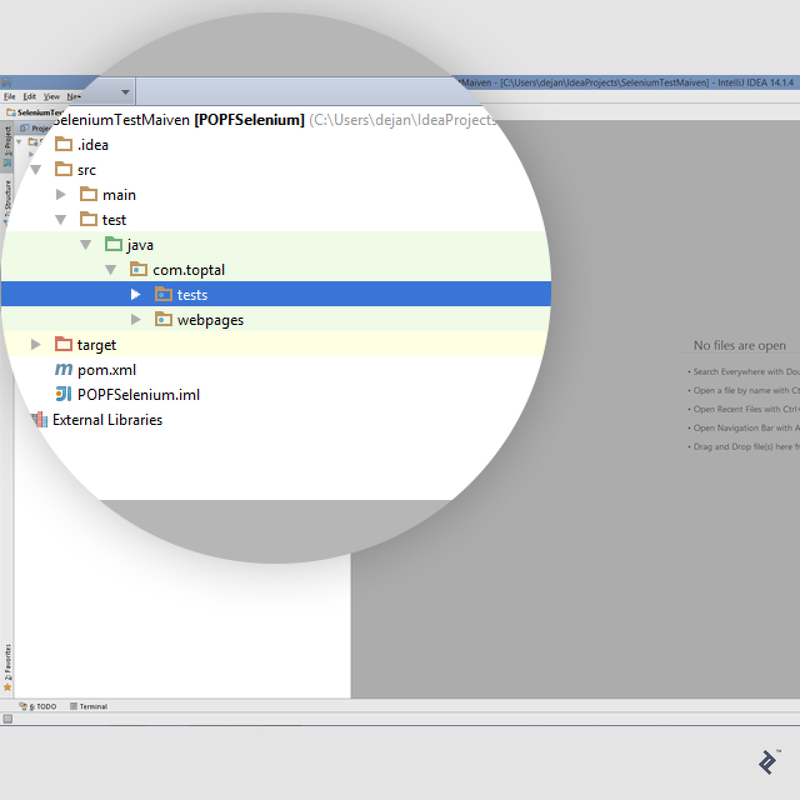 Great article and good example on Selenium and PageObjects infrastructure. The test though, is in my opinion, a bad test example: 1. Test method is too long 2. More than one single feature is being tested in the same method This is a normal issue when TDD/BDD is not in place. I would recommend writing your requirements in Gherkin first. If you are writing Acceptance Tests (which is what Selenium tests are supposed to do), then use a Gherkin based framework such as Cucumber, JBehave or COLA Tests. If you are just writing normal tests, Gherkin based frameworks are still a good option, but it might be simpler to just use a normal JUnit test with some simple comments to identify the Given, When, Then structure. In time this becomes very simple to use and follow. Here is an example of an Acceptance Test using COLA Tests: https://github.com/bmsantos/cola-tests/wiki/Tutorial-%28Java-&-Selenium%29 And here is an example of a simple unit tests still following the Given, When, Then structure: https://github.com/bmsantos/cola-tests/blob/master/cola-tests/src/test/java/com/github/bmsantos/core/cola/filters/FilterProcessorTest.java Disclaimer: I'am the developer of COLA Tests and I've provided such examples without trying to be biased about it. I'm really just trying to show good practices. It's important to get tests right, not only because they test a given feature, but also because they are the entry point for any future developer to understand what a given feature is trying to do... a huge part of the so called "living documentation". Sweet article, I learned a good bit from it! Dejan, what do you think is the advantage of using the PageFactory with InitElements over something like: By button = Driver.FindElement(By.Id("pooper")); button.Click(); adn then performing actions without the page factory? Changing one element on a web page that 20 tests rely on will require one to go through these 20 test routines and update each one to adapt to this newly introduced change. This article is really helped me in Creating and maintaining POM. Thanq very much. Nice article, look very useful and plan to try it, but I need it for testing a native application (I guess there is not prolem with this and it's not exclusive for web apps) which for Android and iOS. Can I use the same tests for both platforms? Pretty Good Article. I liked it. Just tell me please, why the static String PAGE_URL in the HomePage - pageObject should be private ? That way, you cannot call it in other PageObjects, which could invoke a "go_to_home_button". Excellent article, this POM is really helpfull, @dejan_zivanovic:disqus , I have a doubt, is there a difference between @FindBy(How.ID,using="ID") and @FindBy(id="id")?? I see is easier to use just id="id" but not sure whats the advantgae of "HOW"
yes it's needs to be private. Thanks! Dejan, this is not public. Thanks for the great article. Had a question about @FindBys @FindAll. I'm working with a page that has profiles dynamically added and deleted in a table form. There are edit buttons, delete buttons, and information about the profile within the table. Needing to get all parts of the table so I may delete or edit a profile, but here's what we get to work with: .//*[@id='profile_Profile']/table/tbody/tr/td that is the first row, first column upon inspection here is the first row, second column: .//*[@id='profile_Profile']/table/tbody/tr/td then the first row, third column: .//*[@id='profile_Profile']/table/tbody/tr/th then the second row, first column is: .//*[@id='profile_Profile']/table/tbody/tr/td and so forth...how would we be able to get all of these with pagefactory and reference them? Sorry I miss understand your question. Problem with PF is that selector must be final. It can't be dynamic. Generally it's not good to implement on Calendar and Tables. For @FindBys it's just two or more @FindBy that needs to be true in order to define element. If you use @FindAll with many @FindBy in it. Only one of those @FindBy needs to be true to define element. And I think it's not going to be a problem to use it in drop down. Hi. POM and PF and this tutorial will help you out to write clean and more readable tests that are more easy to maintain. If your test fails or they are unstable it can be from some other issues. -For example you shouldn't use Thread.Sleep(); You should use Explicit,Fluent, Implicit Waits. Or to use Ajax initialization of PF and PO with: PageFactory.initElements(new AjaxElementLocatorFactory(driver, 15), this); -Maybe your Assertions are not good. In TestNG there are Soft Asserts. Maybe you can use them -Maybe you are using static methods in your tests or manipulate same data in same time... that prevent parallel execution of test and memory issues. I don't know help you more. xpath of the element is like below one: Counter is a incremental variable "html/body/main/div/div/div/div/ol/li[" + counter + "]/h2/a") Question: How to use page objects in that case? Hi..Nice Article. How do we handle fluent waits, explicit waits on expected conditions when using page factory...when some elements appear dynamically. Thanks for suggestions! I can see that you don't need this blog to tell you "how to run a test" or "how to install dependency" :) This is tutorial from scratch as you can see, and explains basic concepts and setup. Hi, unfortunately @FindBy must be static. So you can use variables that are final. You can't dynamical address it. Closes thing that you can use in this case is something like this: private final String title="VIDEO TITLE"; @FindBy (how=How.XPATH, using = "//*[@id=\"video-title\" and contains(text()," +"\""+ title + "\""+")]") private WebElement linkwithTitle; Skip PF in this case. Thanks! Sorry I really don't know nothing about this certification. Can't help you. It's generally better to set your elements to Private, and then use getters and setters, but to customize them based on how the page uses methods. Like, you only click Buttons. You only swipe on certain areas. Your getters and setters end up shaping your methods. I need to skip the interaction with an element element if it was not found. I did find out that an element is injected as a Proxy that will throws a "NoSuchElementException" when interacting with it. Any cleaner way than catching and ignoring the exception? Hi. For 1,2) If you use AjaxElementLocatorFactory then you don't have a need for Implicit wait on element. PF will try to load element every time when it's used in method. homepage.clickOnButton(). When this is called, PF will try to load button. You can user AjaxElementLocatorFactory always, it's just a async method for element initialization. 3. I personally don't user PF for Explicit wait in general. But that doesn't mean that is the right way :) Problem is that element must be static on the page. If some div that is Loading is dynamically created in any case you can't use PF. I hope that helps! Guys! If you are QA Eng and you want to join Toptal, or if you are company looking for talent here is my referral link to Toptal: https://www.toptal.com/#employ-10x-freelancers ! Thanks! Thanks man, I was strugling with loading Page objects classes, but you knowledge shraring really helped. Hope to see more of such articles from experts. Thanks ! !